Crew operation and regular maintenance of the ballast water treatment system are the most important routines a ship owner can perform to keep the system reliability high. TeamTec offers genuine spare parts, support to onboard crew via phone and e-mail, as well as onboard service by qualified service engineers. TeamTec acquired Oceansaver assets in 2017 and both the IMO and USCG certificates are now listed with TeamTec as the owner. These certificates are directly linked to the parts in the system, setup, operation modes and software. Each part has been subjected to testing and approvals by a USCG approved laboratory and the system is only approved using genuine parts. We have recently experienced several companies offering service on Oceansaver BWTS to customers. Using unauthorized service engineers and spare parts may render the equipment non compliant by our IMO and USCG certificate. Unauthorized service engineers will not have access to the correct software as changes and readouts should only be performed by TeamTec personnel. 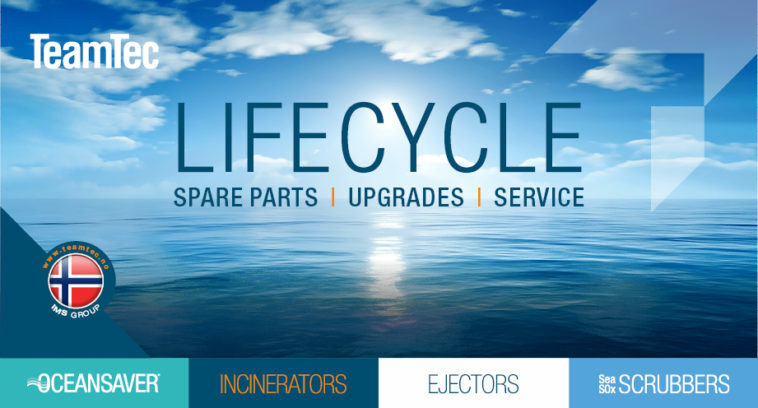 Oceansaver BWTS features several innovative safety features for the crew and vessel, and it is very important that unauthorized service engineers do not overwrite any of the features. We advise owners to always check that the service engineers booked are TeamTec employees. We highly recommend to only order service from TeamTec directly. TeamTec has highly experienced service engineers stationed in Norway, China and Korea. Our service engineers are trained on the equipment, experienced and supported by our shore based experts.